If you want a beginners guide to blogging that will teach you how to setup your site, create content, drive traffic and make money – then you have found it. We’ve written a lot of really good content on this website over the past couple years. I figured it was time to put it all into one place, so that anyone who is starting out with a brand new blog, would be able to learn everything they needed to know. So here you have it, it’s a collection of the finest tutorials, collated in the order that they should be read, so that your new blog isn’t left undiscovered. Start making your money online today. 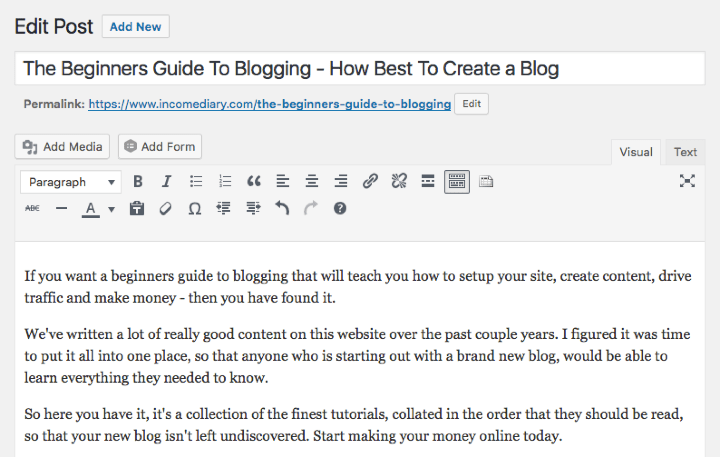 When it comes to any beginners guide to blogging, the first step is always going to include how to setup your blog. This post was designed to encourage people to take up blogging, and start making money online, with just a small amount of start-up money. We all want to start earning a passive income, and one of the best way to do that is with blogging, because if you start writing something that people are interested in, you can start to earn money in ways you’d never considered before, and it starts to surpass the income that you had generated for yourself in the past. Read this post to learn everything from registering your domain, setting up your blog, all the way to making money. Anytime you create something new, whether it’s a product, a service, or a website, start by taking a look at what others have created before you. It’s much easier to follow someone else’s technique that’s been tried and tested, with proven results, and that’s especially true when it comes to website design. Website have become a lot easier to navigate, particularly ones built with WordPress, but I’m still running into sites that I can’t quite get my head around because they haven’t thought their site through properly yet. To help you set the foundation for your blog design, We’ve listed 10 design elements that almost all big blogs have in common and how you can implement them on your WordPress blog. If you want your blog to stand out from the crowd (and you do), then you have to add some customization so that it doesn’t look like everyone else who is using the same theme as you. That’s the beauty of WordPress though, you don’t have to worry about expensive costs of web developers, trying to find someone to do it for you, because you can do it all yourself. It’s often as simple as finding a few plugins (which we recommend in the post), and then perhaps a few additional design details, such as a new header and logo. Not only do the customization’s listed in this post make your website look better, but they actually make it easier to use too, increase reader interaction, and improve the amount of time spent on the site. This is so important, because if you can’t write, then you can’t blog. Fortunately, it’s not as hard as you may think, it just takes a little bit of time to learn. Writing is the easiest thing in the world when you know how to do it, and the most important step has to be learning to plan properly. Sentence structure and grammar will come over time, but so long as you can plan on paper what you want to write, it’s a walk in the park, because you already know everything you’re going to say. After that comes structure for your posts, and additional details that you can include, such as anecdotes, and introductions. 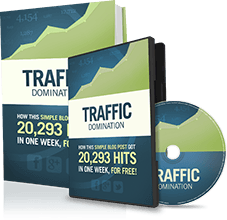 This is my absolute top way of driving traffic to my website because everyone loves a list, packed full of useful information, and if someone disagrees (and they will) with what you’ve written, they’ll be sure to tell you and others all about it, driving even more traffic to your site. 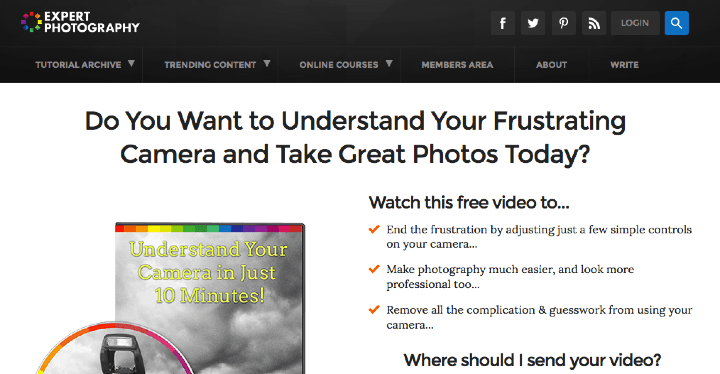 For the sake of this demonstration, I’m going to use my posts titled ’Top 20 Most Influential Photographer Bloggers‘ to show you how to write the ultimate top list, and everything in my list is transferable to any other niche. Coming up with a top list is incredibly easy, and it always surprises me when people ask me what they should write about. You simply write what people are interested in, and what some people are going to disagree with, as this will gain attention for your list. Top Lists are something I try to do every month or two, because not only do you earn more money from them, but they give your Google traffic a boost too. For the first few years, we never tried much with SEO and were able to rank higher then most of our competition. This is because we focused on great content first. Great content helps you to rank high in search engines because you get lots of back links and social shares. This tells Google that people love your content and Google wants to link to sites that their users will love. Today, ranking high in Google still is a big part about creating great content but it’s a lot more competitive now. So if you want number 1 rankings, you got to do some search engine optimization. When I started blogging, I didn’t really have any clue of what I was doing, I just thought that if I was writing good content, then people would find me, but unfortunately it’s not like that, at least not anymore. If you want to do well, then you need to write well, write often and market yourself so that you’re seen by as many people as possible. Blogging isn’t just about writing anymore, it’s about marketing too, so here’s a list of 10 things you can do to get your new blog off the ground. There’s the obvious choices, and the less so obvious, but they’re all things that you should be doing, even if you don’t understand why yet. You may not be sure what use Twitter has in promoting your website yet, but I assure you, it does plenty. I’ve talked in the past about how to improve your quality of visitor, by encouraging them to spend longer on your site and look at more pages, but what about getting them to come there in the first place, or getting them to come back? This post isn’t about related post plugins, it’s about the useful plugins that websites use everyday to find new readers, and encourage older readers to come back. This is the beauty of WordPress, all you have to do is click a few buttons for free, and it will deliver results that you didn’t even think possible. A couple of the Twitter posts alone provide me over 200 hits a day on my website, and the ShareBar only goes to further those results. We all strive for more traffic, and these plugins couldn’t be easier to use, I learned about a few of them as I was researching the post, and my traffic has only improved from there. This is a selection of techniques, which I picked up quite early into starting my website, through the guidance of my brother and this website. This post helps you to identify the sorts of markets that you should be targeting, and then shows how to reach them. There’s a variety of shameless self promotion, mixed with the likes of RSS subscribing and Google traffic, that you really don’t have a whole lot of control over, but it’s important to know how it works because there are tips that you can implement that will help to boost your traffic from those sources. My favorite point has to be word of mouth though, because that truly is free advertising, and it’s easy to create. All you have to do is create content that gets people talking, such as a controversial top list, and people will spread your link around the internet, talking about it. Also, the people or website’s that are featured in the top list will also share the content. Google analytics is by far the most useful tool that I use on the Internet when it comes to tracking the progress of my website. They provide you will all the information you could possibly need (and a load you probably won’t), completely for free. It’s a valuable resource and I’m here to tell you exactly what all the key features do and how you can use them to learn information which will make your website better. I use it daily and you should to, but it helps to know what you’re doing if you’re going to use it. This guide will take you through everything that you need to know about Google Analytics, and help you to learn where you need to make improvements on your site, from the amount of pages your visitors view per visit, to how much money you make on each post. This was a really popular post, because it provided insight into how I manage to run my blog in only 12 hours a week, while working it around other jobs that I do. This is a problem that many new bloggers have; they want to start writing, but can’t seem to find the time. 12 hours a week isn’t hard to find if you start to think of your website less as a hobby, and more as a job. I personally want to make my website into a business so I take a day off each week to work for it, and the money that I make from my website now pays me a good wage for those days. As well as working in evenings, this post shows you how I divide up my time to focus on different aspects of my website, from writing, to promoting and social networking. When you’ve finally got your website set up the way you want it, then it’s time to start focusing your time on writing, and creating original content. Unfortunately, not everyone who starts a blog has the time to do this themselves, so they’re left with either a blog that has very little content, or they have to find outside help. Outsourcing some blogging jobs, whether it’s help with WordPress or more writing for your website, is a really good way of sharing the work load that running a blog sometimes gives you. There’s a learning curve to everything, and blogging is no different, in fact, the learning curve with blogging can be pretty big if you don’t know what you’re doing. It’s not as simple as starting to write and finding your feet from there, it’s much more important to go into it with a clear idea of what you’re doing. So instead of learning from your own mistakes, learn from mine and save yourself some time. I look back on my first website now and I can’t help but laugh, seeing as I know so much more now. A lot of it was down to the writing that I was doing, and not just the subject matter, it was the quality, as well as the structure of each post. I thought that if I just wrote, then people would eventually come, but that’s not true. Or at least I don’t think it’s true, I never waited long enough to find out, and you shouldn’t either. There you have it, my beginners guide to blogging. If I can leave you with one last bit of advice, it would be, the longer you’re not taking action, the more money you are losing. Good timing for this post — I’ve actually just started my new site, IncomeBash.com. And I agree, top lists are a great way of driving traffic, since they are quite easily linked to. I don’t understand how you make money with blogging. To just write about something, how does that produce funds? One question: can I use some of your post on my blog with a link back to the original source??? Thanks Josh for this great list. Now i can recommend this to starters. Awesome. Thanks for this. I just launched my personal blog a couple weeks ago, so this is perfect timing. really, this is the perfect guide for beginners and of course useful knowledge for expert also. I have got a great insight from this article on how to write ultimate toplist. I like the simple language you use that everyone understands. I have been trying various ways to print your series? Is it deliberate on your part to STOP this? Is is excellent and the best way for me would be ro be able to read,underline etc.